Blondie and Brownie: Owls + Hot Pants = Hooters!! 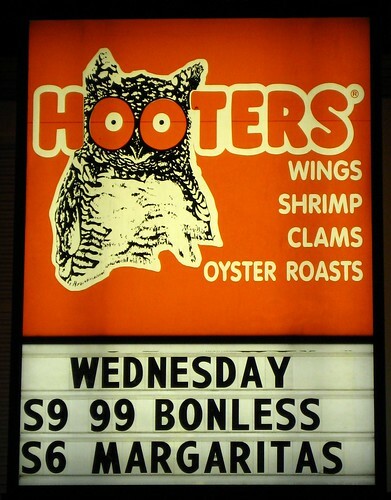 I've been fascinated with Hooters for years, the owl mascot, the orange hot pants, the wings. 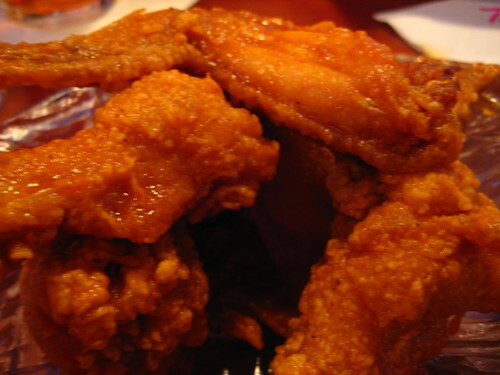 Many believe that their wings are among the best available in the world. Until last week the closest I had come to these famed wings, besides a boyfriend calling me from Hooters, was the Las Vegas Hooters Casino and Hotel. Moniker, Hooters lover that she is, decided it was high time to put an end to that. We met at the only Hooters in NYC for some Monday night wings. For those of you too conservative to enter a Hooters, the inside is like a typical sports bar, light wood flooring, large TV screens, a fully stocked bar with an ample beer selections, and woman in orange short shorts. The music wasn't blaring like many Midtown bars, you could sit, have a drink and hear the person with you. 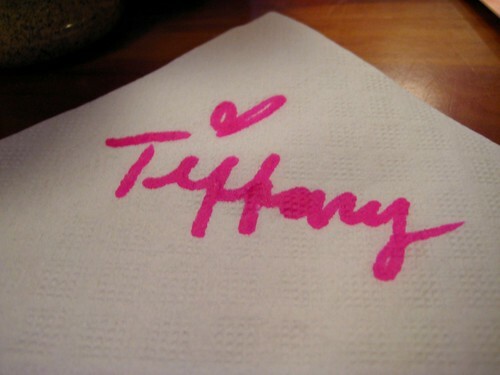 Our waitress was Tiffany, who patiently waited for me to make up my mind. 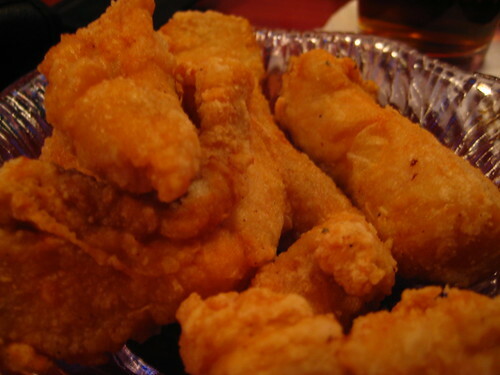 I love wings, but I also love chicken strips, and oh look, fried pickles, Brownie's been looking for those. Moniker let me order them all, she's a good friend. We got two types of wings, medium and hot. The medium wings were only marginally spicy. Enough to feel the spice, but nowhere near my maximum spice tolerance. The hot wings sauce have a redder and spicier sauce. Definitely hotter than the medium, but still nowhere as hot as say a Chicken Tikka roll. Next time I go, I will be getting the hot. Frozen breaded chicken strips, good for kids, not for adults. Fried pickles, breaded outside, crunchy inside. Their wings may not be fresh, but they are very meaty and big. Everything here is on the pricey side for what it is, comparable wings can be had in NYC. 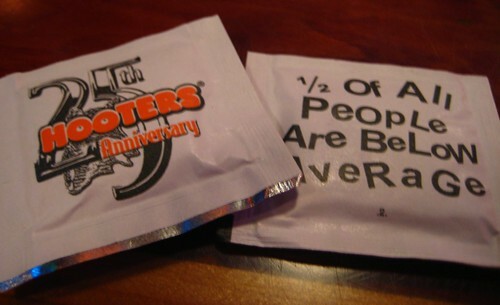 The best part of this Hooters might be the free Wi-fi. With their nice outdoor seating recessed from the street, I would not be against going here when the weather's better, have some wings and a beer outside. mmm.. butter on the wings. that's good stuff. Mmmm. You had me at friend pickles. I want to go. 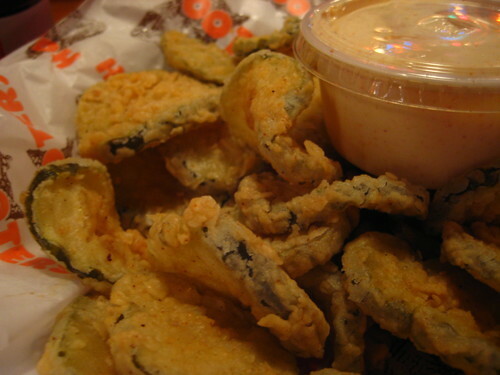 There may be many places with fried pickles. I'm not sure because I've never actually sought them out. I did, however, see something I definitely never noticed on a menu a few days ago. It was an appetizer called "Deep Fried Pickle Wrapped Pastrami" at Five Napkin Burger on the corner of Ninth Ave and 45th St. I didn't try it, and have no idea what it is, but reading this post made me think of it. I did however, try the burger which was pricy but really tasty. Brother Jimmy's has amazing "Frickles"
Are they really large and tasty now? I'm tempted to try them again, but... in the pics they still look scrawny with more skin than meat, as compared to the 'regular' non-NYC Hooter wings. @danny: Butter on anything is good stuff. @Meyekull: All the more reason for Brownie and I to got to 5 Napkin. @Selina and Jenn: Yes, the fried pickle/frickle concept has been slowly making inroads in NYC 'Southern' or 'BBQ' place. 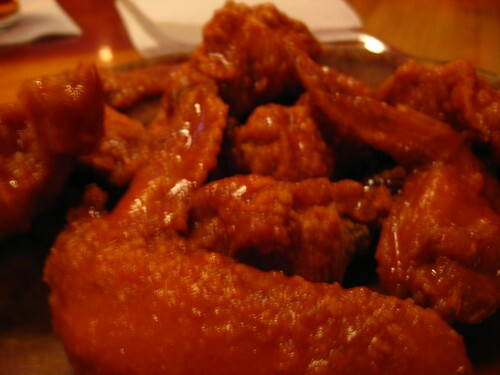 @Anon: they're probably not the best wings in NYC, but I wouldn't call them scrawny. I've had much MUCH scrawnier.